Perhaps taking a cue from our own Laura Hudson, who frequently gives creators advice on how to get press attention when she speaks on the Indie Comics Marketing Panel at conventions around the U.S., the creators of acclaimed Image Comics series Reed Gunther have made themselves heard by creating an innovative press release that is too clever to be ignored. Brothers Shane and Chris Houghton make an unassailable appeal to readers and retailers to consider all-ages comics in their proper context -- comics made for all ages, not just children. You can check out the full two-page comic below. 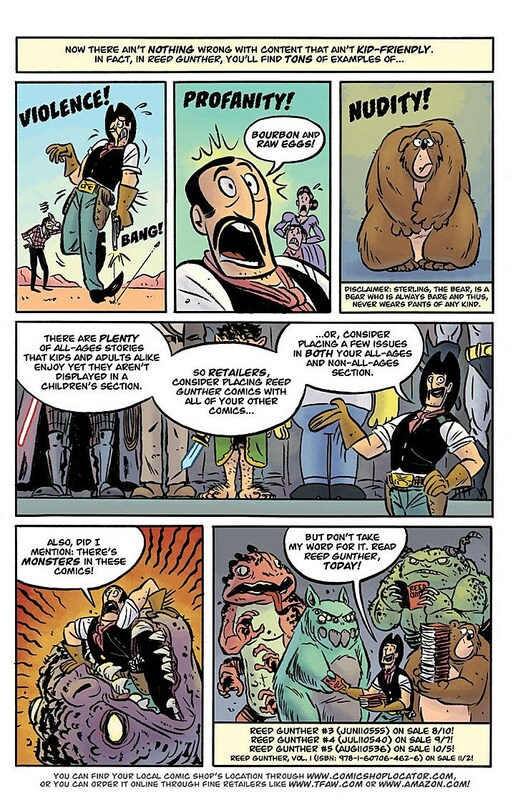 Created by brothers Shane Houghton and Chris Houghton, Reed Gunther depicts the exploits of the lovably inept cowboy adventurer Reed Gunther and his curiously bright and typically frustrated grizzly bear, Sterling. The series is absolutely kid-friendly, but, as the label implies, suitable for all-ages. 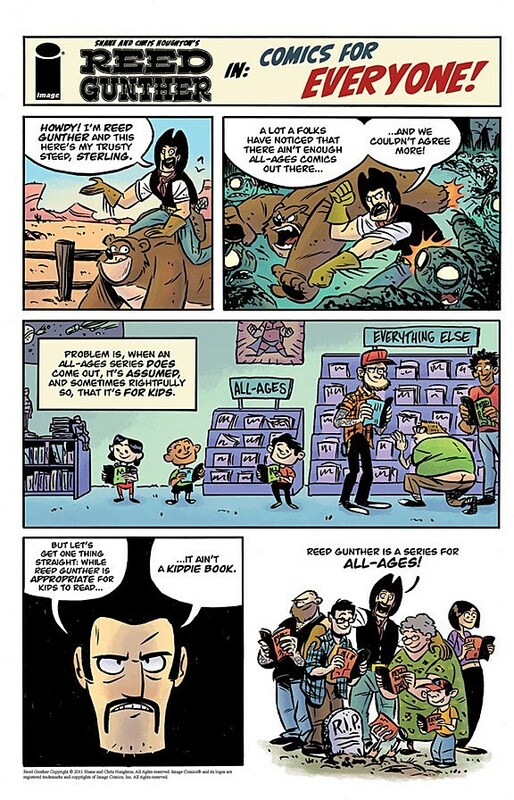 The story depicted in the cool comic-as-press-release suggests that some retailers and readers have confused "all-ages" for "kiddie stuff," and Reed himself offers some helpful suggestions on how to correct the situation. Reed Gunther is a favorite of many comics creators, including Usagi Yojimbo's Stan Sakai, outgoing B.P.R.D. artist Guy Davis and Fraggle Rock and Our Love is Real writer Sam Humphries. Three issues are on sale now from Image, and you can check out a preview right here.